in serial production of gear boxes KAPP NILES Current research findings indicate that it is possible to increase the efficiency of gear transmissions without compromising the strength by reducing surface irregularities of the tooth flanks and using low-viscosity gear oil. These results are based on testing of gears which were manufactured by vibratory finishing. However, for serial producers of gearboxes, in particular, this process is not suitable in automated operations. 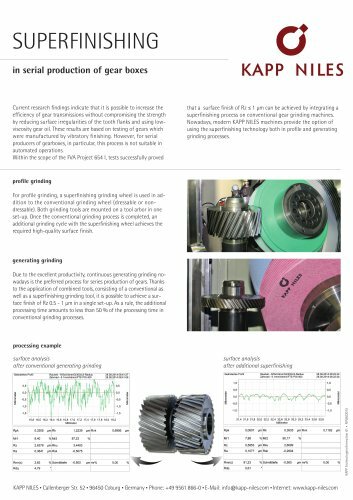 Within the scope of the FVA Project 654 I, tests successfully proved that a surface finish of Rz < 1 pm can be achieved by integrating a superfinishing process on conventional gear grinding machines. Nowadays, modern KAPP NILES machines provide the option of using the superfinishing technology both in profile and generating grinding processes. surface analysis after additional superfinishing profile grinding For profile grinding, a superfinishing grinding wheel is used in addition to the conventional grinding wheel (dressable or non-dressable). Both grinding tools are mounted on a tool arbor in one set-up. Once the conventional grinding process is completed, an additional grinding cycle with the superfinishing wheel achieves the required high-quality surface finish. generating grinding Due to the excellent productivity, continuous generating grinding nowadays is the preferred process for series production of gears. Thanks to the application of combined tools, consisting of a conventional as well as a superfinishing grinding tool, it is possible to achieve a surface finish of Rz 0.5 - 1 pm in a single set-up. As a rule, the additional processing time amounts to less than 50 % of the processing time in conventional grinding processes. processing example surface analysis after conventional generating grinding KAPP NILES • Callenberger Str. 52 • 96450 Coburg • Germany • Phone: +49 9561 866-0 • E-Mail: info@kapp-niles.com • Internet: www.kapp-niles.